In the Summer of ’69 a young Jim Walsh of Maryland farewelled his cousin Tom, a strapping man with long blonde hair, who was heading off to the West to start a new life. But it was the machine his older cousin rode, resplendent in the summer sun a Triumph Bonneville Twin, that captured his attention and would live on in Jim’s memory for a lifetime. 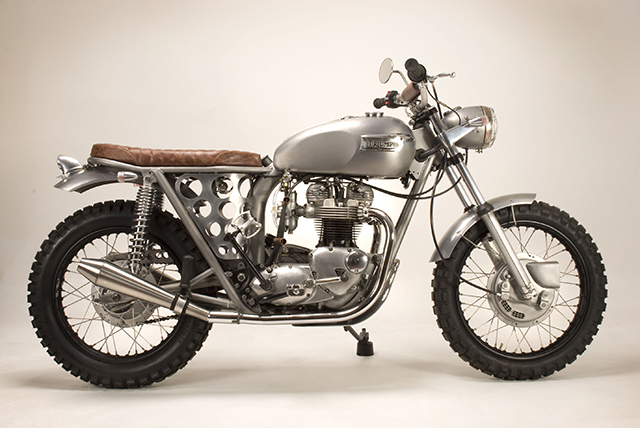 It’s a memory that has become a passion when nearly 50 years later Jim learned of Tom’s death and in this most recent Northern Winter commissioned the boys at Vintage Steele in Vermont to build a Triumph of his own. 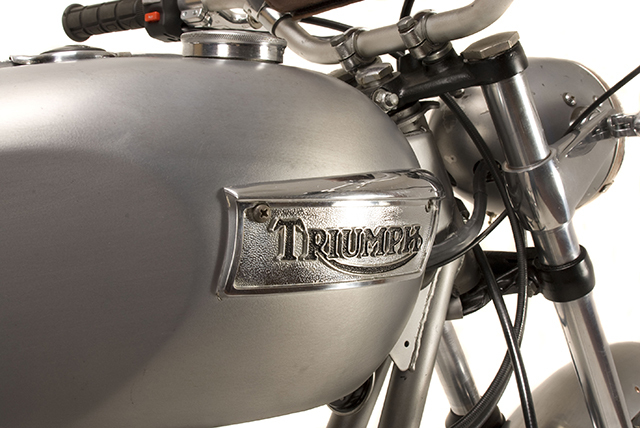 There are few marques that have had the impact on motorcycle culture as has British maker Triumph. For more than 100 years Triumph motorcycles have been surrounded by owners absolutely passionate about anything and everything the brand does and with good reason. From powering Steve McQueen in the Great Escape with a TR6 Trophy, to the 6T Thunderbird playing a starring role in the original biker film “The Wild One” alongside Marlon Brando and on the track being the first manufacturer to do a 100mph lap at the famed Isle of Man TT there is plenty to be proud of. 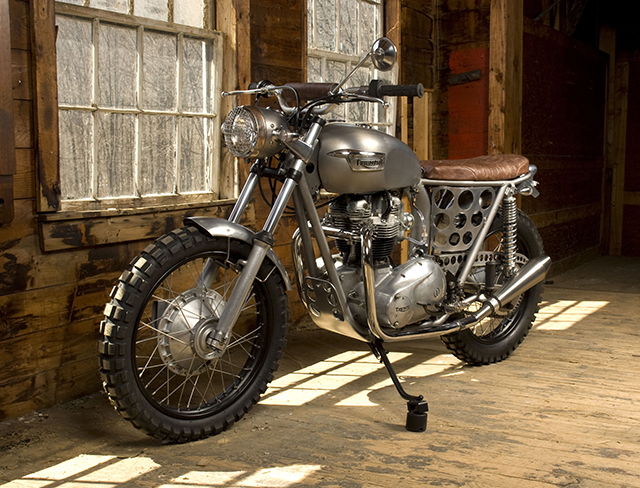 It’s that pride and passion that brought Jim together with Vintage Steele’s Josh and Chris from their Brattleboro workshop Jim tasked the boys with creating a hybrid, functional piece of art from the bones of an old Triumph and shaped by a long ago memory. Knowing their friend Ryan had the perfect blank canvas he was willing to let go, his 1971 Triumph Tiger was quickly purchased. The bottom end of the 650 Twin had recently been rebuilt so VS set about making sure the top end was in just as good condition. The torquey 650 is remarkably smooth for a parallel twin and mated to the bullet proof gearbox that also swapped cogs for Trident 750 Jim can cruise the back roads in reliable style. The Amal carb has been restored to better than new condition with the benefit of modern lines and filter. 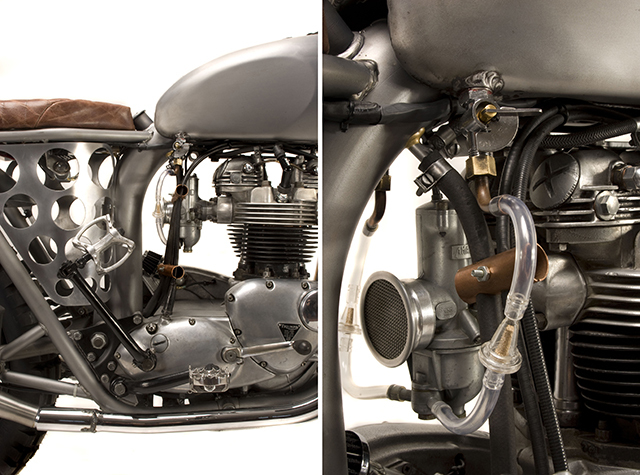 The exhaust gases exit from the picture perfect headers all the way to the reverse cone mufflers that thump to the Triumph Twin beat. The oil in frame chassis is not only a work of art but clears up a great deal of space to customise the look of the ole Tiger. While negative space is well used to show off the engine, large punched sheet fills the space under the rustic leather seat that gives the bike a true vintage look. The same leather look adorns the pad of the modern motocross bars that fit seamlessly with the look of the build. Vintage levers with only a single mirror and one modern switch block give an uncluttered look and allow the large bucket headlight with steel grill to take the spotlight up front. While bare bones headlight ears and bullet style indicators do their job while disappearing majestically into the full picture. Vintage Steele is as much about craftsmanship as it is restoration and nothing shows off your work like raw metal and just sparing use of black paint. Filler and layers of lacquer can hide a half done job, but this tank is picture perfect and even the welds for the fuel tap are shown off rather than hidden away. 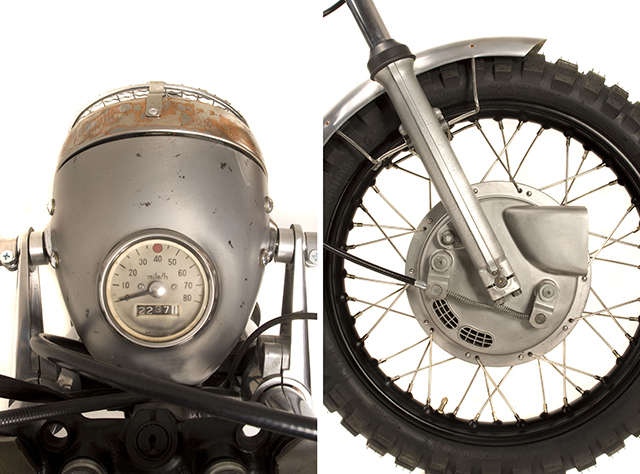 The front and rear guards are minimalist but their finish compliments the bikes form without simply being a necessary bolt on and the leading drum brake is restored to perfection, its scoop and vents a reminder of the technology of the time. The foot pegs would have been a God send to McQueen, Dirt bike style and chunky, and the kick start pedal ensures no slip and is raw, industrial and fitted for a purpose. But nothing completes the look of this truly hybrid Tiger like the spoked rims wrapped in aggressively treaded rubber. It’s more Blacksmith meets The Great Escape than Ace Café on the A406, but that’s just what Jim wanted and Vintage Steele never fail to deliver!